The Mesolithic Resource Group is an independent research group, which formed in 2006 to investigate the use of materials and technologies during the Mesolithic period of northern Europe. The Mesolithic period spans the Middle Stone Age (11,500 - 6,000 years ago) and by drawing from archaeology, anthropology, ethnography, the environment, and craft traditions, we test the possibilities of the past through experimental archaeology with an emphasis on ancient and primitive skills. By having a knowledge of the environmental resources of our ancestors, and by using those resources in realistic experiments, we can gain a greater understanding of how our ancestors lived, as well as improving our knowledge of seasonality and procurement. Our recent research includes an investigation of birch bark tar production in the Middle Palaeolithic and Mesolithic fishing techniques in western Scotland. Public participation and education is where Experimental Archaeology has a real strength, we achieve this through our outreach programme of workshops, interactive displays and by encouraging involvement in our practical sessions. We conduct bespoke courses, workshops, and demonstrations in a range of Primitive Skills and technologies, including: primitive jewellery, bone and antler work, cordage making, primitive fishing, green-wood working, and primitive fire making. Alternatively, we can offer suggestions on the use of Experimental Archaeology, such as viable hypotheses, methodologies and the execution of the experiments, regardless of technology and period. Please contact us if you would like to discuss collaborative projects or ideas for experiments. We offer courses, workshops, and demonstrations in a range of primitive skills and ancient technologies. From greenwood working to bushcraft skills, contact us if you are interested in learning more. 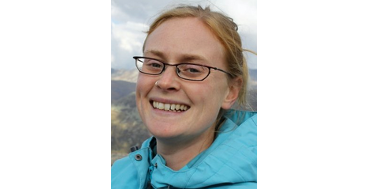 Dr Peter Groom and Dr Tine Schenck have conducted a number of research projects to investigate the techniques and technologies used by Mesolithic hunter-gatherers. 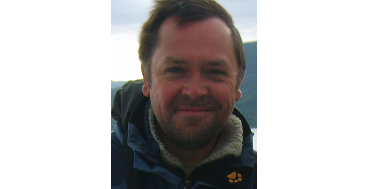 Peter Groom is an Environmentalist (MSc) and Experimental Archaeologist (MA). His Ph.D. from the University of Edinburgh used experimental archaeology to explore Mesolithic coastal fishing practices and shellfish procurement in western Scotland. Peter draws on his extensive experience and knowledge of natural history, nature conservation and wilderness activities, and has worked for many years as a lecturer on these subjects. He has an array of primitive and traditional skills and has worked extensively with the production and use of natural, plant-based fibres. 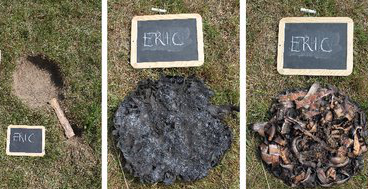 His range of environmental knowledge and experience, combined with his skills as an Experimental Archaeologist means that Peter is competently qualified to lead and instruct our primitive skills and bushcraft courses. Peter is a member of EXARC - the international organisation of Archaeological Open-Air Museums (AOAM) and Experimental Archaeology - and has worked on a number of research projects as well as writing a novel: The Hunter, The Dog Men, and the House by the Shore. Tine Schenck is an Archaeologist with an MPhil in Archaeology and an MA in Experimental Archaeology. 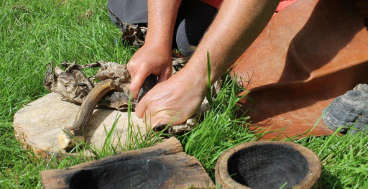 Her Ph.D at the University of Exeter entitled Accessing intangible technologies through experimental archaeology - a methodological analysis, explored the methodology of experimental archaeology in regards to researching lost organic materials and 'invisible' technologies. Her previous research includes various container manufacturing techniques such as baskets, birch bark vessels, and ceramics. Tine is also interested in the method and theory of Experimental Archaeology and has engaged in public participation for the purpose of educational analysis. She tested hafting types for TRB halberds in the project Dimensions of Functionality in Prehistoric Societies with Christian Horn at the University of Gothenburg. View the video of Hafting and Testing of a Lithic Halberd (Funnel Beaker Culture). As well as being a Director of the MRG, Tine is a founder of ArchaeologistsEngage, an independent non-profit group who seek to enable engagement between professional archaeologists and the public.